Seating ltd ~ Advance tix here! Tuesday evenings starting September 1. Email us to reserve a seat! 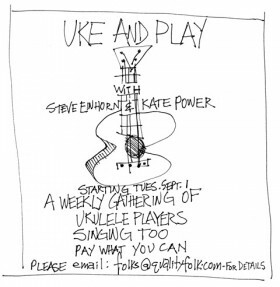 Kate Power, Steve Einhorn, Kevin Shay Johnson, Mick Doherty & Lauren Sheehan gather and music is ALIVE! Stay tuned for Portlanders coming soon. Steve and I just received Scott Docherty’s pictures of the Winterfolk Concert held on Saturday night at the Aladdin Theater in Portland, Oregon. 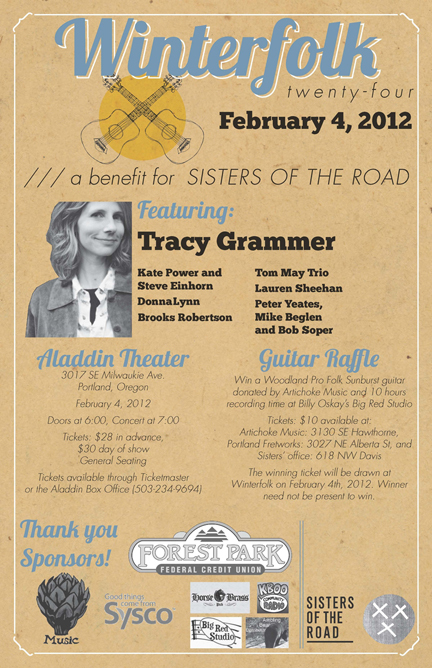 Winterfolk is a music benefit for the beloved Sisters of the Road Cafe who feed the hungry and homeless in Portland and provide nourishment for the body and soul with dignity and grace. They have helped countless people get back on their feet in Portland and Winterfolk has been an annual backbone of support to raise money for the meals they make. The music benefit has produced more than 150,000 meals over the years and we all have been honored to play a part in their beautiful mission. It’s a highlight for us to get to play in the lineup at Winterfolk but participation goes deeper than songs or billing on the poster; just being a part of the event is an annual reminder of the fine line between the have’s and the have-not’s and the sink or swim situation we are all faced with, if not for ourselves then for our neighbors, friends and relatives and we remain grateful to be part of the survival team Sisters invited us to join. For many years, Utah Phillips donated his performance as a friend and brethren of Sisters of the Road. He knew their history inside and out; he ate their food and he loved their founder, Genny Nelson and the many people she served. Utah was always generous in performance and he engaged with everyone in a way that made us laugh, cry and believe that we were all related to the same heart and that in itself was a great gift we took personally. He strengthened the cause and was a rich thread in the fabric of humanity and the history we shared. He taught us all a great deal about being a good folksinger and a true human being. We loved him and he loved us with his music and his friendship. There was never a better storyteller than U. Utah Phillips, RIP. Our songs this round transcended the oldest of bonds and grew a few new ones, both in the audience and backstage, as they brought me all the way from my first musical memories in Portland in 1981 to last night thirty-years later to sing on one of the city’s historic stages in a benefit to feed the hungry with songs from the heart that sing about what matters. Our friendship with Sisters of the Road goes back twenty years when Artichoke Music started selling raffle tickets for a damn good guitar, selling tickets starting on the day after Thanksgiving and pulling the winning ticket during intermission at the Winterfolk Concert. Artichoke Music still carries on the tradition we began all those years ago and for that, we are grateful. The lucky winner would also win ten hours in Big Red Studio with prime time recording engineer, Billy Oskay at the board. We could see the wave of eyebrows rise on more than a few musicians in the house as they registered the magnitude of the prize, “Wow.” A good guitar and ten hours in a world-class recording studio was no small thing and very desirable for the many independent musicians and songwriters in the crowd. This was Portland, after all. Little did she know when she grinned at us as we headed onstage with her thumbs up and “Go get my guitar!” that we would do just that. I turned the little latch on the side of the barrel and thrust my right hand in to dig, fingers searching, swishing, digging some more and reached for a ticket that had the feel of an underdog waiting to be found. My hand closed on a ticket underneath the pile and pulled it out to read into the microphone, “Oh my God!” I grinned. Written in neat blue ink was the name, “Cinda Tilgner!” and the place went wild with a mix of the joy of the ecstatic and groans of the disappointed. Oh well, there’s always next year. Cinda was one happy, stunned, dazed but grinning winner as she was called to the stage to accept her prize and realized it really was her turn this time and the gods had chosen to grant her wish with the prize. Get your tickets and take a seat for one of the best shows in the new year to celebrate music and feed the hungry of Portland. Winterfolk XXIV, hosted by the great Tom May, who will serve up an evening of handpicked musicians from the folkscape of Portland and the nation. This event is the main fundraiser to create meals for the hungry with grace and dignity in Portland at the Sisters of the Road Cafe. Utah Phillips was a long supporter of this event up until his death a couple of years ago. The legacy continues in his memory and for the sake of Portland’s own. This year features the great Tracy Grammer, Lauren Sheehan, DonnaLynn, Brooks Robertson, Peter Yeates, Mike Beglan, Bob Soper, the Tom May Trio and the two of us, Kate Power & Steve Einhorn. If the Aladdin Theatre will fills to the brim for this event, many thousands of meals will be paid for to feed folks in need. In this economic climate, the line between the have’s and the have not’s grows thinner by the day. Score some karmic points and get tickets for you and your loved ones, friends and co-workers, neighbors and family and join us for the most meaningful concert of the year in Portland – Winterfolk XXIV at the Aladdin Theater next Saturday night. Raffle tickets for a great guitar from Artichoke Music and a day in Billy Oskay’s divine studio at Big Red are available up until the drawing during the intermission. Show up. Get lucky. Feel the love.